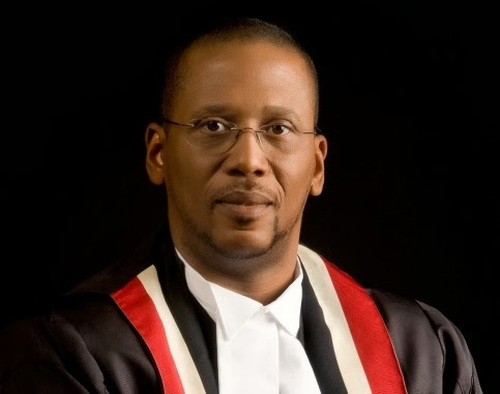 Attorney Martin Daly SC and former head of the Public Service Reginald Dumas have issued a joint media statement in response to a Sunday Express report on evidence gathered against High Court judge and former magistrate Avason Quinlan-Williams. Photo: President Anthony Carmona (centre) appoints High Court judges Kevin Ramcharan (far left), Marcia Ayers-Caesar (second from left) and Avason Quinlan-Williams (far right) in April 2017. Also in the photo is Chief Justice and JLSC chairman Ivor Archie. The Express article, written by Sheila Rampersad, transcribed excerpts of the audio recording of court proceedings in the Port of Spain Magistrates’ Court 4B, at 3.06pm on 29 June 2009, in which defendants Anthony Wilson and Robert Spencer informed Quinlan-Williams they had already appeared before another magistrate and were denied bail. Quinlan-Williams is the wife of acting Police Commissioner Stephen Williams. We are deeply troubled by a report in last Sunday’s Express newspaper which compares and contrasts the contents of a recording of what took place at a bail hearing before Mrs Quinlan-Williams as a Magistrate in 2009 and what Mrs Quinlan-Williams is reported to have testified at disciplinary proceedings against her arising out of her conduct of that bail hearing. There are also other reported conflicts in the evidence. 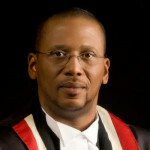 Photo: Chief Justice and JLSC chairman Ivor Archie. This former magistrate has very recently been appointed a High Court judge and we are absolutely satisfied that the public interest requires that the determination of the disciplinary tribunal be released so that the public can be assured of the propriety of the appointment of Mrs Quinlan-Williams to the office of High Court judge. We are aware that the Judicial and Legal Service Commission (JLSC) reportedly sent Mrs Quinlan-Williams a letter stating that she was “exonerated” nine months after the determination of the charge. We do not need to dwell on the current controversies surrounding recent judicial appointments and why, as a result, very many citizens will not accept an assurance from the JLSC as being the end of any matter. In any event a separate and independent tribunal’s determination concerning the charge against Mrs Quinlan-Williams is apparently available. The release of this tribunal’s determination has been previously refused on what appears to be a specious ground, uncaring of the public interest and the repugnancy of closed-door justice. 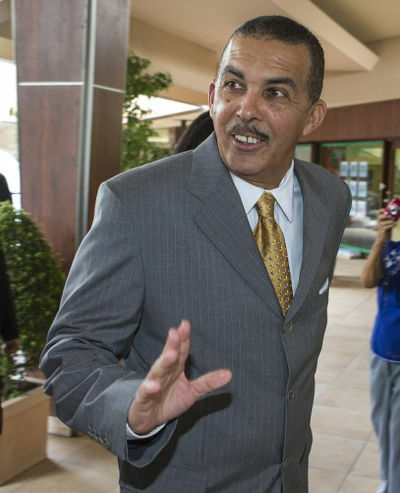 Mr Justice Carmona—as he then was—now President of the Republic of Trinidad and Tobago, is said to have been the [one-man] tribunal dealing with the disciplinary charge and to have made his determination perilously close to his elevation to President Designate. Any further delay in releasing his determination runs the clear risk of bringing his office into an unseemly fray. This would be in addition to increasing the ongoing reputational damage to which recent blunderings of the JLSC have exposed the Judiciary. We call on the JLSC to release forthwith the tribunal’s determination of the charge and/or charges against Mrs Quinlan-Williams along with any written reasons or report related to it. The Justice system in any country is the bastion of fairmess and equality of treatment to all citizens..
Let us not avoiding seeing what is before our eyes..The root of this problem is the appointment of women with hyphenated names..Can see it now says the JSlC..”Oh you come here for wuk with more than one last name? look woman.doh make mih…. Savitri the Industrial Court does not deal with disciplinary matters but rather disputes between employers and employees. The former Magistrate who reported this matter was interviewed by the press and quite rightly said that there was no onus on the JLSC to inform him of the outcome. His function was to give evidence on oath about his knowledge of the matter and it ends there. What if the dispute is about disciplinary matters? That’s what they would like us to do Sav. To look in the other direction and leave them to do as they please. Both Messrs Daly and Dumas ought to know that the disciplinary process between employers and employees and such like are held in strict confidentiality and the outcome is also a matter of concern for the parties involved and no one else. The “public interest” as cited does not arise. Public servants, police officers and in fact workers in general including attorneys at law are themselves subjected to some sort of disciplinary procedure and the outcome of those are never declared publicly. Why is Justice Quinlan-Williams’ situation different? That is not entirely accurate. Google our Public Service Commission and you can see some cases listed by following the specific link located at the bottom of the page. I can recall reading one disciplinary matter involving a Prison Officer. There may be others. Those are public records. How can there not be a case for public interest when the conduct of a high court judge and a State body is called into question? The conduct of Volney was called into question in a certain Brad Boyce matter and went all the way to the Privy Council. So too with Sherman McNicolls, Jagdeo Singh (a magistrate’s name was tarnished) and so too was Patrick Jagessar’s matter. Don’t forget Patrick Manning lost 4 cases at the Privy Council for interfering with the legal process. There is precedent for transparency in judicial matters. I will go no further with this for now but in the meantime find out from Daly or Dumas if they acted differently when they led the Law Association and the Public Service respectively whether they publicly made known the facts and outcome of disciplinary matters where lawyers and public servants were charged for breaches of discipline. Since it was likely to impact the justice system or how public service was provided. I am very familiar with the process in which i participated all the way to Public Service Appeal Board and i challenge anyone to show where the particulars of a disciplinary action is a matter for public knowledge. During the trial of the Vindra Naipaul accused one of the defense attorneys was disbarred from practicing law following an alleged act of misconduct. The presiding judge initiated a “gag order” on the press preventing them from reporting on the circumstances that led to the lawyer’s demise but to simply say that he would take no further part in the trial. Mr Logie I am also familiar with the issue involving the prisons officer. He was served a notice to initiate disciplinary action following the escape of a prisoner in his custody and nothing was done in furtherance to the investigation until after 4 years had elapsed. The officer then filed an action in court citing “abuse of process”, that hearing became a matter of public record as it was ventilated in court and it was not a part of the disciplinary process itself. The Privy Council website lists numerous cases from out of Trinidad as well as other (former) British territories… as does the Supreme Court website. Google is your friend. I will give you a clue… Patrick Manning had 4 judgments AGAINST him and his administration. They are all publicly available and were highly publicised. Surely you see a difference in the implications for the judicial system in the case of a bent or unethical high court judge as opposed to a crooked defence attorney Justin N C Pablo. Not so? It concerned the alleged misconduct of a magistrate. She was duly charged and the matter was heard by then Justice Carmona the result of which remains unknown to the public and rightly so. The result of that process is matter for the JLSC and the person charged. Mischief is the only reason that this is an issue after all this time. I am no respecter of closed door horse trading, particular by public figures. I have only contempt for any suggestion that the figures involved deserve the privacy that less well heeled person rarely ever get. Justice needs to be seen to be done in this case as far as I am concerned. I understand it to be a common law practice that forms part of Administrative Law and it’s not unique to Trinidad and Tobago. However for clarity you should find out from the goodly gentleman the legal basis for such a call and precedent to support it. It is decidedly simple to understand the rational and even moral basis for such a call. Whether there is a legal basis is another matter entirely and I can’t argue with anyone over the legal fine print. But what I also know is that legal fine print has been created specifically to protect high heeled horse traders for centuries. For me, it is no contradiction for something to be legally right and wrong at the same time. What would the purpose of such a law be? To protect the sanctity of justice? If so, it has failed in that regard and cannot hide whatever high heeled horse traders are attempting to duck behind it. Not entirely true. In the 19th and 20th centuries, vast changes were made to contract law to protect consumers and weaker parties. There is now a rather level playing field. The law applies across the board without prejudice or reference to class. It gives the employer the right to discipline his employees and to maintain strict confidentiality in doing so. The same principle apply for Pennywise as well as the public service and beyond. Certainly not true. You may be seeing with blinkered eyes. Most employment tribunals or court matters are open to the public. For me, something with implications for the integrity of a High Court judge/magistrate isn’t a matter for closed door horse trading. That has a direct impact on the public service being provided in a way that doesn’t apply to the bag packer at Pennywise. So I reject that. Law is adaptable. You must know that. It wasn’t delivered in a burning bush on Mount Horeb. Certainly not true in the majority of instances. Info can’t be obtained via FOI? I remember when she granted the bail and there appeared to be something wrong then. That means even more so now. What all commentators are silent on with this issue is that the Chief Justice heads the Judiciary and the JLSC. That is a dangerous precedent and the main reason for the appearance of bias in appointments and promotions. There must be some separation of powers between these two institutions. Appoint laypersons to Chair and to the JLSC and to balance the skewed favor to the Chief Justice in making appointments, promotions and discipline. The former judges should be removed. On what grounds, pray, can the authorities fail to respond affirmatively to this request/demand? Is it conceivable that they would have the arrogance to simply ignore it? Sadly, there is no ‘coming storm’. The typical islander is apathetic, lazy and selfish (in the sense of seeking his/her own livelihood and gratifications). We have seen it time and again. They rely on others who (in their minds) are better positioned to ‘do something’ hence an overreliance on people such as Daly and Dumas. The ability to further check the hubris and arrogance of politicians in these matters is further tainted by political opponents with their own agendas… eg., the former AG who is/was quick to jump into action with pre-action protocol letters, then claiming it is for the ‘people’. The reality is that it is an opportunistic attempt to garner publicity and score political ‘upmanship’ against the sitting government. I say this because it is a foolish naivety to believe these legal minds were not aware of these problems before the public became noisy protestors… the few that is who are involved. I come back to my point that there is/never will be any ‘coming storm’. The good thing is that the few who are protesting (not burning tyres, mind you) will likely see this to the end all the way up to the Privy Council, if only because they are conscientious citizens. Ah, Jumbie, but you don’t take Marx’s point about critical mass. You seem to be thinking that since the majority of citizens are apathetic and all the other things you describe, maybe accurately, la injusticia is safe. I’m not sure. The economic situation is such that there is general disaffection and it is widespread. The tyre-burning crowd aren’t taking their lead from the ones who are utilising other means to lodge their protests. Particularly as, I insist, the current set of official (mis)leaders are such bunglers and so myopic; they don’t see the real impact of anything they do, of all the separate actions they take until it is too late. So I’ll continue to believe, if you don’t mind, in the tormenta que les (nos?) viene encima. Just a quick question… Can you think of an instance in the last 100 years where there was an incident where the situation reached ‘critical mass’ and the people responded? Butler does not count as that was not a matter of public interest but of employment. I think you misunderstand my position. My contention is not so much that the situation gets to the point where something has to give; what I am saying is that for something to give eventually, the proportion of the population actively supporting it does not have to be in excess of 50%. A handful of serious committed citizens can theoretically trigger fundamental change. Think, Jumbie, if you want a negative example, of the number 114 and the year 1990. Well what comess is this? A husband n wife tag team – one eh locking up whom he should lock up n the other easing up those she should not ease up. The Williams’ merry go round(wrong). Wait, wait, wait! Is this a case where Thomas did Quinlan a favour and her grateful husband is not investigating Thomas on possible breaches of the law? Say it ain’t so! Will we ever get to brutal honesty to admit how much intelligent people are deluded in this country? And therefore, consider the state of the less schooled, less educated? And thus, then, our total condition?! After the hubbub it will die down. After all they protect their own. You know after this debacle I have less than zero confidence in the judiciary. Many ordinary people were of the opinion that it’s really a “boys and girls” club. It would seem that getting promoted depends on who is your friend. That sordid affair with Ayers-Caesar was the last straw. I’ve heard she was elevated to the Chief Magistrate position ahead of more qualified candidates and her elevation to the bench seems to have followed that same pattern. And then Quailan’s relationship to the acting COP may very well have been a factor in her matter. At the end of the day what should be the last bastion of decent and fair treatment has been shown to be disgustingly close to what obtains in political circles and private enterprise. Yup. I forgot about that. The two persons in question in court told her they appeared before a magistrate earlier that day so she would have had prior knowledge before setting bail.